This card took me a lot of time because I couldn't decide how to proceed. I had this sheet of paper (8.5x11") that I REALLY liked, and thought it would make a pretty card. After viewing a LOT of card folds, I decided to fold it into thirds. The front third I cut diagonally from the top of the fold about 4" down. 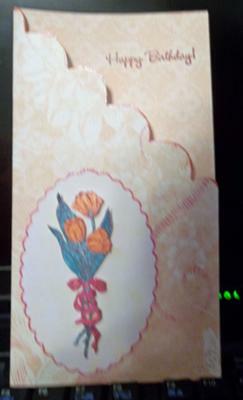 Then dry embossed the design and used the scissors to cut right above the ebossed image. I used a glitter pen to outline the very top of the dry emboss for a little flare. The third fold I folded over the second - to cover the white side on the inside of the card, and taped down. At this point I was stumped as to how to finish it. Several weeks passed, my sister came to visit and saw the card. She loved it. That's when I decided it would be a birthday card for her, and I still had a couple of weeks to finish it. Still no ideas - especially keeping in mind that she lives in another state and this would go by mail! I finally decided on a 3" scalloped oval, which I also used the glitter pen on the edge. Stamped a flower bouquet and colored using glitter pens, cut it out and used foam dots to attach to the oval, which was attached to the card using small foam squares. "Happy Birthday" is stamped on the inside top. She LOVED the card, so this was a success! A very pretty Tri-fold card and I am sure your sister was delighted with her birthday card... even if it stumped you to start with. There are many folds and ideas in the Projects sections and the Tri-fold has full instructions on how to make it ... including the insert. A lovely use of one sided paper - very ingenious of you. I always hate to use the two two sided sheets when one side is going to be totally hidden. So here is a great solution to either dilemma. Wow I really like your card. You have given me some ideas on how to proceed with a birthday card that I have to make for my grand daughter by May 11. Thanks so very much.